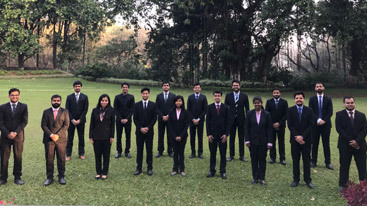 LakshyaSM is a unique endeavour of PGDIE students of NITIE which nurtures Industry-Industry-Institute (3Is) interaction to keep students updated with current requirements of the corporate world. Since its inception in 2000, LakshyaSM has grown in leaps and bounds and has earned a respect for itself in the corporate world and the student’s fraternity equally. LakshyaSM under the umbrella of Avartan – The annual business festival of NITIE, organizes a series of unique events, which offers a perfect forum for knowledge sharing among the current and future leaders of industry. Avartan provides a unique knowledge sharing platform for the industry, academia and the student community. In this era of globalization where competition is the order of the day, industries need a platform where they could share their excellence among various industries and budding managers to not only show the world what it takes to be successful but also to improve themselves by gaining rich experiences from others. In Avartan, the fraternities of NITIE felicitate business leaders with the LakshyaSM Business Visionary Award. These awards are given in recognition and appreciation of achievements, to those industry leaders, who have emerged winners due to their exemplary vision and extraordinary leadership. The ‘Visionary Award’ has historically been presented to prolific business tycoons including Adi Godrej, Ratan Tata, Rahul Bajaj, Azim Premji, Venu Srinivasan, Nandan Nilekani and Sunil Bharti Mittal who have changed the course of Indian business internationally. NITIE, presented Lakshya Business Visionary Award 2017 to two industry leaders namely Mr. Onkar S Kanwar, Chairman Managing Director, Apollo Tyres Ltd. and Mr. Harsh Mariwala, Chairman, Marico Ltd. (Marico). NITIE with utmost respect felicitates with LakshyaSM Distinguished Leader Award in recognition and appreciation to the paragons of India who devoted their entire life in shaping the future of India in various fields through their sterling Leadership.was conferred to Dr. V K Saraswat, Member, NITI Aayog, Former Secretary Department of Defence RD, Former Director General DRDO. The Industrial Engineering Conclave is an initiative under Avartan organized by Team LakshyaSM which is aligned with our 46 years old flagship course PGD in Industrial Engineering. The event aims at holding meaningful discussion amongst Industry leaders of various organizations. Eminent speakers from various backgrounds spoke on the topic “Role of Industrial Engineering in Make in India” in Avartan 2017. NITIE is known as “Mecca of Supply Chain Management”. The Supply chain management conclave is an event that comes under Avartan. This event is an attempt to bring the best minds in the supply chain from different industries. The topic of the supply chain management conclave of Avartan 2017 was “Supply Chain Resilience”. Manufacturing Conclave is an initiative under Avartan organized by Team LakshyaSM to bring the best minds in the manufacturing from different industries to discuss the latest manufacturing trend and topics. This conference is designed to help achieving manufacturing excellence across these core operational areas of maintenance, continuous improvement and safety. The topic of the conclave of Avartan 2017 was “Digital Manufacturing”. Under the umbrella of LakshyaSM, Power Talks is a candid Gyan session to enlighten the ignited young managerial minds in the institute. This year, Capt. Raghu Raman, Group President, Risk, Security and New Ventures, Reliance Industries graced the event. It is an ideal platform for practicing managers to present their innovative and path-breaking projects. The projects are judged by an elite jury panel consisting of industry stalwarts (VPs MDs of top notch firms). It is a confluence of best practices, technological advancements, their implementations and impact on the industry and equips the budding managers with the latest trends and advancements. LakshyaSM 2017 On the Job Achievers' Contest" had participation from corporate sector across five well-defined verticals namely Supply Chain Management, Operations Management, Systems IT Management, General HR Management and Industrial Engineering. It provides a platform for B school students from all over the country to participate and prove their mettle. It consists of compettions namely Lakshwiz Bazar, Lakshwiz D-Street and Lakshwiz factory. Sparsha is a perfect amalgamation of business and social responsibility, an initiative of students to bring the socially relevant projects of NGO's and the CSR projects of the industry on one rostrum and give them a fortuity to present their wonderful initiatives in front of eminent corporate jury members who witness the future endeavour of the society and award the best project in each category i.e. CSR and NGO.